Postdocs at the Research Plenary led by Al Sattelberger. Argonne held its 7th Annual Postdoctoral Research and Career Symposium on October 23 at the TCS Conference Center. The event furthered the research, career and professional goals of the lab’s postdoctoral students through company exhibits, panel discussions, networking sessions, plenary speakers, career-building information, and a poster session where 55 postdocs presented their own research highlights. View photos from the 2014 Symposium. The symposium was organized by the Postdoctoral Society of Argonne (PSA), and was co-sponsored by the American Association for the Advancement of Science, Euclid TechLabs, Illinois Science and Technology Coalition and Materials Development, Inc. The event garnered more than 100 attendees. “This year’s symposium was different from previous ones,” said PSA President Perry Motsegood. “We made some changes to increase attendance, visibility, prominence and interaction with the Argonne community.” The symposium went from two days to one, thus increasing outside company sponsorship; moved its poster session to the cafeteria and gave poster awards; and featured postdoctoral speakers nominated by their ALDs. The day began with welcoming words from PSA Vice President, Jeremy Love, a postdoctoral researcher in Argonne’s High Energy Physics Division. Keynote speaker and Argonne Solar Scientist Seth Darling then spoke on “A Random Walk through Science…and Drawing on Those Experiences,” where he described his own career path, his experience as a young researcher, and the importance of learning from every experience and staying open to new opportunities. Jumping from science to careers, during the Career Skills Plenary, Argonne Educational Programs Director Meridith Bruozas talked about “Networking at a Social Event,” giving suggestions on targeted networking for maximum effect. Research, as always, was a big focus of the symposium. Al Sattelberger, Deputy Director of Programs, led the Research Plenary, which provided an overview of Argonne’s research missions and themes. Sattelberger’s opening presentation was followed by those of four postdoctoral researchers, who represented Argonne’s four laboratory directorates. These postdocs were nominated by their respective ALDs and included Sebastian Boisvert (CELS), Doga Gursoy (XSD), Brandon R. Long (CSE) and Canan Uckun (ES). To raise the visibility of postdoctoral research, posters were featured in Argonne’s cafeteria during lunchtime. 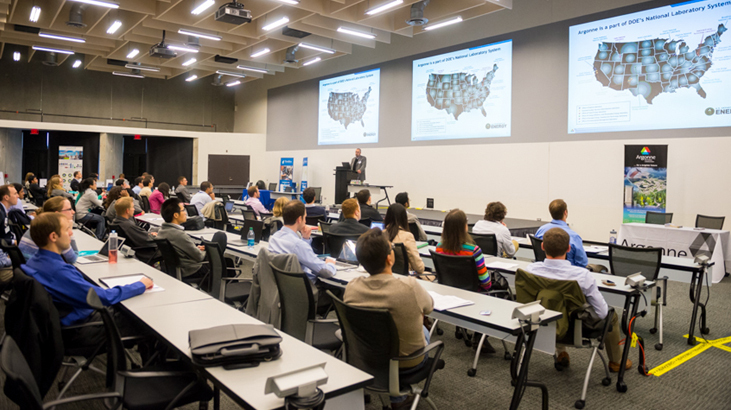 Postdocs had the opportunity to compete for cash prizes, and to present and discuss their research with the Argonne community and outside visitors from industry and academia. Judges reviewed the posters and awarded first place to Jonathan Emery (MSD), second place to Michael Welland (MSD), and third place to Alex Gaiduk (University of Chicago). Company presentations and exhibits, and industry and academic panel discussions allowed postdocs to network with real-world companies and universities to explore job opportunities, and Argonne alumni shared their experiences of life after Argonne in special panel sessions. The PSA is already thinking about the 2015 Symposium and other efforts to make Argonne’s postdoctoral community shine. To learn more about Argonne’s postdocs, visit the postdoctoral blog at https://blogs.anl.gov/postdoc/. To learn more about all of Argonne’s Educational Programs that turn STEM students into the future’s researchers, visit http://www.anl.gov/education. This entry was posted in Announcements and tagged postdoc symposium, Postdoctoral Research and Career Symposium. Bookmark the permalink.